Enter your email address below to receive your free ebook. We only send emails we think you want and will help and you can unsubscribe anytime you like. Why are we giving it away for free? Simply, we want to help more people. Our goal is to help women, men, and children who live in unhealthy and unsafe environments. We want to break the cycle of violence, neglect, and abuse that is so prevalent in our society, yet is hidden in the shadows. If we limited access we would also limit the amount we can help, also limiting our ability to help as many people as possible in a meaningful and possibly life-changing way. Everything on this site, every resource, is free. Please share! Share with your friends, your family... anyone you care about. Give us a shout-out on Facebook and Twitter. And if you find our content useful, or think it can be useful to others, please donate. Any amount helps, and ensures we have the resources to reach those who need it most, publish more blog posts, provide more resources, and help as many people as we can to live happier and healthier lives. Each chapter of this E-Book explains an Abusive Type and their motivations, their outlooks, their traits, the traits of their victims, strategies to avoid and separate from them, and more. 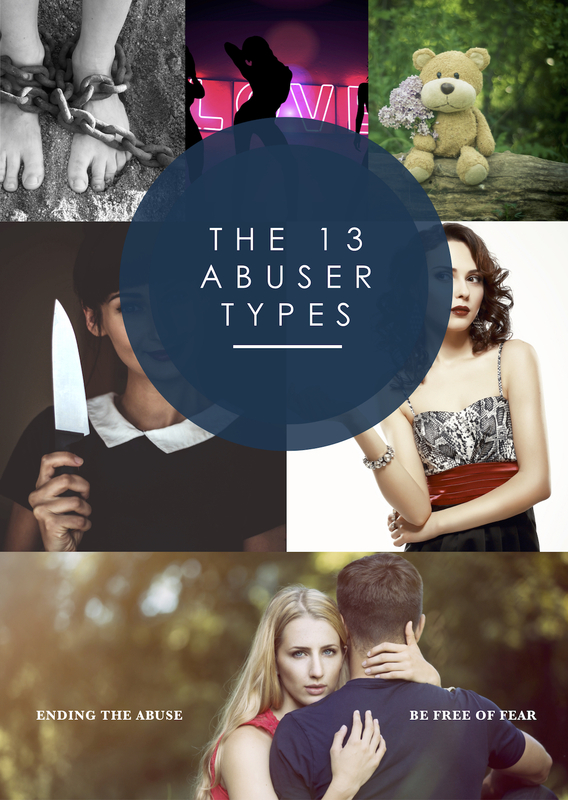 We believe every abusive person and relationship includes one or more of these 13 Abusive Types. That is why we've spent a lot of effort to put together this comprehensive descriptions and strategies for each of the 13 Abusive Types.